Spending more time in Nature is a major key to achieving good health. In fact, I try to encourage my readers to get outside and explore your local surroundings as much as you can. You might just discover the hidden treasures that Nature has to offer. A few weeks ago, I unexpectedly had to travel from my home in Massachusetts to Maryland to tend to some personal matters. It had been 10 years since I had visited The Old Line State in August. And let me tell you, the heat and humidity were oppressive! On our free days, we escaped the D.C. beltway bubble and visited some of the beautiful, less hot and humid parts of Maryland. We took similar weekend jaunts when I worked for the National Institutes of Health and Walter Reed National Military Medical Center. At that time, I’d been focused more on affairs in Washington, D.C. and internationally. But after the tragedies of 9/11, we avoided downtown D.C. on weekends. Instead, we headed out to the mostly unspoiled farmlands, foothills, and the ancient Appalachians to the west. On this trip, however, we took a day to drive northeast — to the beautiful state capital of Annapolis, which is much older, and more authentically historic than D.C…. Like towns in the western part of the state, Annapolis sits apart from the mania and corruption of the nation’s capital. We spent some of the day in Annapolis exploring the Helen Avalynne Tawes Garden — a state botanical garden named in honor of the former first lady of Maryland. She and Governor J. Milliard Tawes were the state’s hosts from 1959-1967. The garden is nestled amid state government office buildings, including the headquarters of the Department of Natural Resources. And it boasts a stunning array of plants native to Maryland. These important plants grow naturally in the distinct ecological regions of this diverse state — from the estuaries of the Chesapeake in the east, to the central piedmont area and Potomac River Valley floodplain, to the ancient mountains in the west. Despite the name, this beautiful plant is a native to Maryland. It typically covers big, wide, sandy flood plains (typical of central Maryland). It’s also adapted to living in woodlands. It sprouts and engages in photosynthesis before the leaves on trees come out. But by July, the leaves and stems wither, dry up, and blow away. The roots, however, continue to thrive underground. 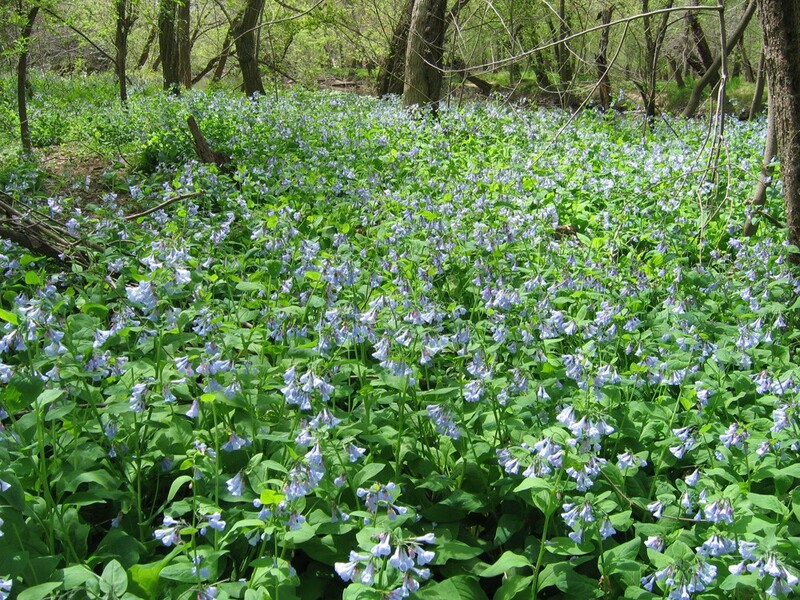 The ephemeral flowers of the Virginia bluebells tremendously benefit the local ecosystem. For one, bees loves them. And almost one-third (30 percent) of Maryland’s native bees are dependent on this species. I also saw hardier types of plants, such as this perennial evergreen groundcover. Part of the Antennaria species, pussytoes bloom in late spring. And their fuzzy flowers look like kitten feet. They thrive in dry soil, devoid of mineral content. The Cherokee made a tea from this plant to help aid in digestion. The Tawes garden also featured this Maryland plant, which finishes flowering in early spring. 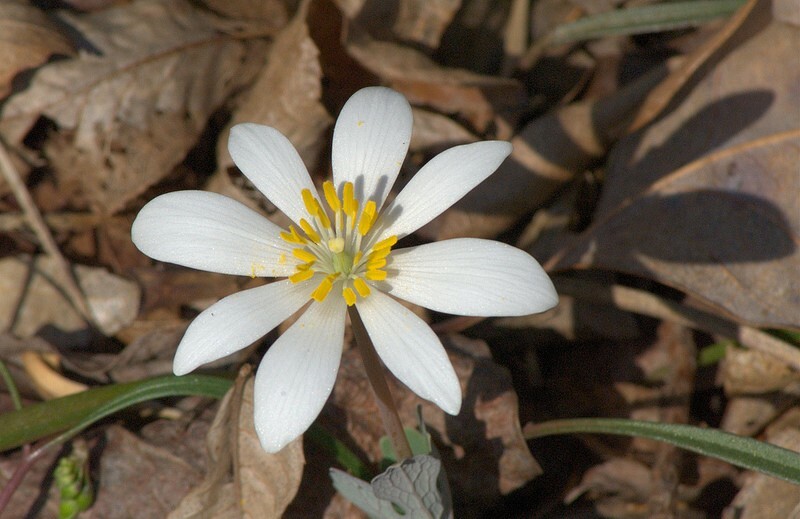 When you pinch off a leaf, bloodroot “bleeds” red sap. Although it can be toxic, the root enjoyed widespread use among Native Indians for a variety of illnesses, including asthma, bronchitis, and rheumatism. The root juice was also popular as a dye. 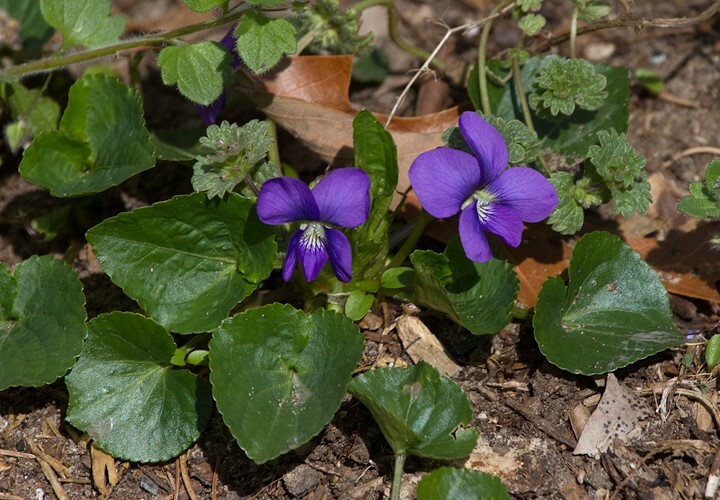 The Tawes garden also featured common blue violets. 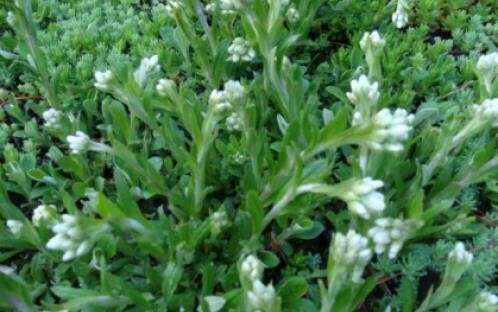 The leaves and flowers of this delicate flower are edible — you can eat them raw in salads. You can also steam or sauté them, like you would spinach. Native Americans used this plant to treat colds and headaches. And in his Medical Flora, a Manual of the Medical Botany of the United States of North America (1828 – 1830), French biologist Constantine Samuel Rafinesque wrote that his contemporaries in America used the common blue violet to treat coughs, sore throats, and constipation. In Nature, the flowers attract bumblebees and several varieties of butterflies. I also saw several beautiful species of azalea, rhododendron, and dogwood, which are also all native to Maryland. While all green in August — they put on quite an annual show of color in late May. Although most people think of urban and suburban areas of Maryland, the state does have some beautiful areas of untouched Nature. And you don’t have to go far to find them. The same is true of many older cities in the U.S. So, this fall, as the leaves start to change in many parts of the country, take the opportunity to visit a little-known garden or park you’ve never explored before. I hope it will lift your spirit, as it did mine. P.S. Of course, you don’t always have to leave your home to discover the wonders of Nature. In fact, I talk about the fascinating uses of common weeds that grow in your lawn, in the September issue of my monthly Insider’s Cures newsletter (“Ten free ‘superfoods’ growing right in your backyard”). Subscribers have access to my entire archive. Not a subscriber? Just click here to get started today.